Big Cartel/Shopify/BigCommerce: Which is Best for Artists? In last week’s post, I outlined a sales funnel for artists who want to grow their business and sell their art online. This week I’m going to introduce you to the top three “build your own store” e-commerce sites for artists. It’s a rumble in the jungle, a Texas death match, where only one will survive. Brace yourself for the carnage! Ok, sorry, got a little carried away there. The truth is, each of the e-commerce sites I’ll be reviewing have their own pros and cons. What works for one artist may not be best for another. I know which one I want to use to build out the funnel I’ll be showing in these posts, but that doesn’t necessarily mean that it’s the best one for you. So let’s go through them carefully and take a good hard look at what they have to offer. In the end I’ll let you know which one I want to use and why, but ultimately it is up to you to decide which one you think is best for your particular goals. There is no such thing as a one size fits all e-commerce solution. You have got to make your choice based on your own research and goals. I am legally obliged to tell you that if you choose to implement this funnel or follow any of the advice given in these posts, your results are not guaranteed. This is NOT a get rich quick scheme and I am not responsible for the choices you make based on my advice. Ok? Ok, let’s get to it. Over the last several years, e-commerce has begun to dramatically shift the way artists sell their art. The days of needing a gallery so you can sell your art to the elite are coming to an end. You see, nowadays there’s this thing called the Internet, and it provides a fast and easy way for people to buy our work without having to go to a gallery or convention. Our work can now be seen by anybody, anywhere in the world, even those big time art collectors who used to hang out in galleries. There are many e-commerce companies out there and it seems like more and more pop up each day. It’s important to understand which of these sites let you market and sell your art with the least restriction and build an artistic empire that helps you take over the world. With so many to choose from, which one is right for you? Hell if I know, so let’s find out together. Big Cartel was founded in 2005 and was designed specifically for artists. Of the e-commerce sites reviewed in this post, it is the least expensive to operate and the easiest to get up and running. You can start with a free account and upload up to 5 products, attach your PayPal, and you’re essentially good to go. There are no hidden fees, no bandwidth limitations, and they do not charge transaction fees on anything you sell. However, they only take payments through PayPal, and PayPal does charge a fee for each transaction they process. Big Cartel’s paid plans range from $9.99 to $29.99 per month and you can upgrade, downgrade, or cancel at anytime. While Big Cartel gets major points for its affordable price structure and ease of use, its lack of features is not easy to overlook. Currently, and I don’t expect this to change anytime soon, Big Cartel only has five storefront themes to choose from, and only 3 of them are mobile responsive. What that means for you is that regardless of which theme you choose, your store’s basic look, layout, and function will be exactly the same as 50,000 other artists, unless you know how to code or you hire a developer to code it for you. Big Cartel is also limited on other key features that are necessary to really build a fully functional sales funnel. Not good if you really want to get your name out there and sell your art. On the other hand, the one thing I can say about my Big Cartel store is that it always manages to pay for itself whether I’m driving traffic to it or not. This is a big one for me. If there is one thing I have learned while running this website and blog for the last 6 months it’s that customer support is super important. When things go wrong (and trust me, things will go wrong) you really need the ability to get a hold of somebody 24/7 anytime you need them. Big Cartel’s customer support solution is email, Monday through Friday from 9-5 Eastern Standard time. No phone support, no live chat. Email. On weekdays. This simply won’t cut it. At least for me. But is it right for you? Even with its limited features, if you were of the mind to keep it simple and were willing to accept small sales numbers and the limitations on influencing customer behavior, a Big Cartel store attached to a Mailchimp account and Printful (a print-on-demand company we will talk about next week) would come in at less than 30 bucks a month, and would easily pay for itself and make a small profit if you worked your Instagram and drove traffic regularly. Not bad, but not nearly as good as it could be. Shopify was founded in 2006 and is one of the fastest growing companies in the world. Today they host over 120,000 stores, with more added each day. Shopify’s primary focus is on design, and this can be seen not only in the design of the platform itself but in their very extensive themes library as well. 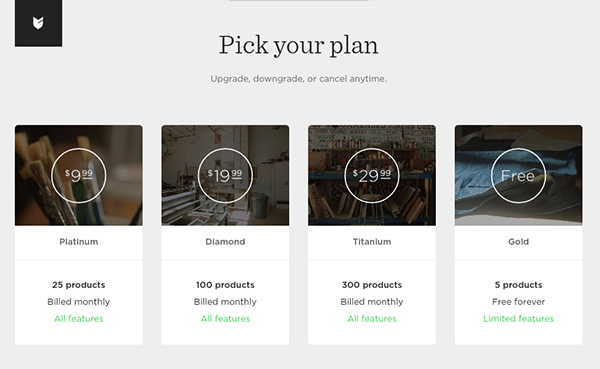 Shopify users can select from hundreds of built in pre-made themes or build their own if they know how. While many themes are free, there are also premium themes available that typically range from $80 to $200. 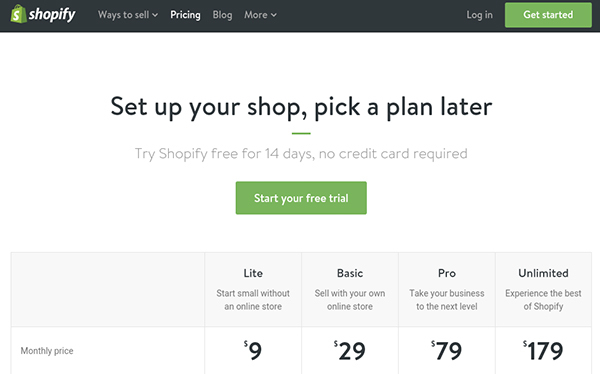 Like Big Cartel, Shopify comes with all of the basic tools necessary to set up and run an online store. However, unlike Big Cartel, Shopify has an amazing app store featuring advanced marketing functions like pop-ups, abandoned cart savers and killer SEO and data analytics. In fact, the Shopify App Store currently has over 1,100 apps developed both in house and by third party developers. With plenty of options, an in store blog if you want it, and seamless integration with damn near everything, it’s safe to say that if you want something, they have it. A lot of the services come standard, and some apps are free while others only offer a limited free trial followed by a monthly fee. On the down side, Shopify does charge a transaction fee unless you use their pay gate. 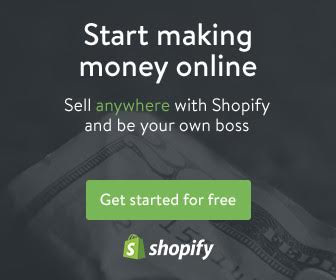 The Shopify platform has a limited time free trial before a monthly fee kicks in. Unlike Big Cartel, there is no free plan to be found. Prices range from $29 to $179 per month for most users, but they also have a “let’s talk about it in private, super expensive pricing so high we can’t even tell you what it will be” plan for god only knows who could afford it. Probably the most unusual thing about Shopify is their $9 “lite” plan. This plan does not include an online storefront or any of the integrations or apps. Instead, it offers the hobby artist a Facebook “store” and buy it now buttons, effectively turning that social media platform into an online mini store. Kinda neat if you’re into that kinda thing. The best thing about Shopify is their third party integrations. Their platform works with just about everybody. Nearly every major email marketing service provider integrates with Shopify as does most major print-on-demand companies and nearly anybody else you can think of or could possibly ever need. If you’re looking for a platform with all the bells and whistles you need, look no further than Shopify. While the pricing is expensive, at least compared to Big Cartel, a $29 a month plan with a select number of apps to support your marketing goals, attached to an appropriate email marketing service and any number of print-on-demand services (perhaps two or more at the same time) could, depending on the marketing tactics you apply, more than pay for itself month over month and give us the opportunity for real growth and earning potential. We may not hit our under $50 a month goal, but we won’t be over by much, and if it pays all its own expenses and puts extra money in our pockets, do we really care? Shopify’s customer support is really good, with agents available via live chat or phone 24/7 even if you don’t have an account. They are friendly and helpful and willing to work with you to solve your problems. Compared to the other services on this list, BigCommerce is the new kid on the block, but that hasn’t stopped it from getting big fast. 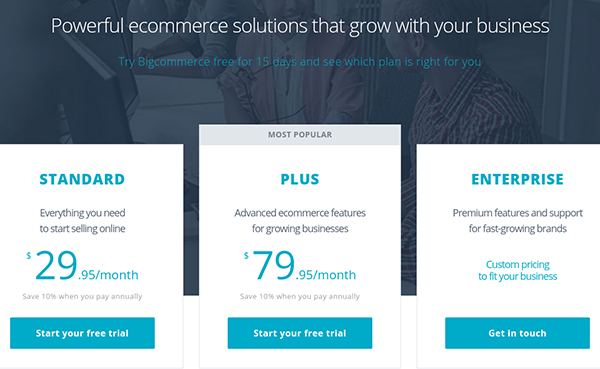 With a ton of features that just keep growing, BigCommerce is working really hard to be the best choice out there. In most respects it’s very similar to Shopify. Its payment plans are almost identical and its user interface is too. There are hundreds of themes and apps both free and paid, but their integrations with third party vendors are fewer than Shopify. However, BigCommerce just announced a major new integration – it has partnered with alibaba.com, a Chinese direct to merchant wholesale company that offers thousands of products to the merchant right from the BigCommerce platform. While the ability to offer wholesale products will be a huge benefit for small and mid-sized businesses offering consumer products, it doesn’t do much for the artist. However, this integration may push BigCommerce to the top spot soon as that partnership will draw more users and consequently more third party apps aimed at those users. Like Shopify, BigCommerce comes standard with a built-in blog feature and an App Store that allows you to add the extra functions you need simply and easily. There are no transaction fees with BigCommerce regardless of what pay gate you use, which allows your BigCommerce to accept payment from anywhere in the world, a feature that Shopify’s pay gate lacks. The BigCommerce customer support team is flat out awesome. They are available when ever you need them even if you aren’t signed up for an account. They are friendly, super helpful, and even called me to make sure I got the answers I needed. How cool is that? All things considered, a BigCommerce store connected to an email marketing service and a print-on-demand service would definitely do the job well, but the fewer apps and integrations makes it hard to choose them over Shopify (for now at least). I do think BigCommerce is the best in terms of customer service which is a huge plus, but I just can’t get the add-ons that I really want with them. At least not yet. 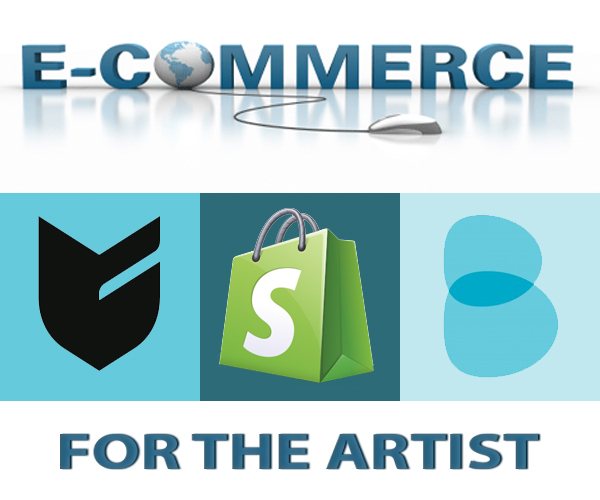 If you’re looking to become a serious professional artist who makes their living selling their art, or want to expand your existing tattoo, convention, or commission art sales business, then Shopify or BigCommerce is clearly the way to go. Honestly, BigCommerce and Shopify are so similar that choosing between the two is really hard. It all comes down to what’s important to you. If the transaction fees are a deal breaker for you, then BigCommerce is the best option, but for me, Shopify has all the apps and integrations I need to really make this thing sing. So my pick for this blog series at least is Shopify. Having said that, please understand that if I were building a sales funnel for a client, I would choose whichever of these three platforms best suited their needs and goals. It is my intent throughout the course of this blog series to actually build a sales funnel step by step so you can see how it’s done. Once it’s built, I’ll show you exactly how many followers were added to the Instagram account I build this on (we are gonna start with five followers or less), how many of those followers actually went to the store, and how I got them to do that. I’ll also show you exactly how much money was made month over month using this funnel. But here’s the thing – I really need you guys to talk back to me. So do me a favor, each week sound off in the comments below and let and me know what you think and what questions you still have. I am writing these posts for you (I already know this stuff so I’m not doing it for me lol) and I don’t just want to monologue like an evil villain in a bad comic, so talk back, chime in and tell me what you want. Which of these three platforms best suit your particular needs? Like I mentioned earlier, I want to build this funnel as we go and your answers will help me decide which platform to build on for these posts. My intent is to build it out on Shopify to show you what a fully functional sales funnel can do, BUT, if most of you guys are planning on using Big Cartel or BigCommerce then that’s something I really need to know. Next week we will take a look at print-on-demand. I’m super excited to show you guys all the awesome stuff you’re gonna be able to put your art on. DISCLAIMER: This post contains affiliate links to services that I have researched fully and highly recommend. I will receive a small commission if you purchase through one of these affiliate links, but the price you pay is the same. I think i would test the waters first, so big cartell is probably what im gonna do. Baby steps. Christopher, I recently stumbled onto your website and can I tell you, I haven’t been so happy about an accidental find in so long!!!!! From your amazing skills and tutorials on my new obsession (Copic) to these incredible and unbelievably valuable posts on marketing, your site is a true GEM!!!! I have a question for u, as an artist looking to create an online store with p.o.d. option and also a blog platform, who do you suggest going through for a domain???? I started a website blog last year and I am currently debating whether to renew my domain and hosting with my current provider or switch to someone new because my needs have changed (starting with the very domain name) and I’m not sure my current provider is the best. Can u suggest some options? great post. I’m going to research all three some more. Thanks for sharing! Thanks man, just made time to read this because of the holidays, but I’m super excited to see the linking parts. I’m doing this model the way your setting it up so I’ll let you know how it goes. Pura Vida bro! Thanks for the encouragement man! This is gonna work really well for you! This has all been really helpful for me, you have no idea (I’ve read all your posts now). I’ve been deliberating about all of these marketing details and what companies to use for waaayyyyyy too long now. It has been frustrating to not get any clear answers anywhere out there on the net. I very much appreciate all of the effort you have put into this information gathering and decision making and sharing of your results. I know it’s a lot of work. THANK YOU. I have been considering going with Shopify. But now I will look into BigCommerce as well. Thanks for the heads up. Just as a side note: I also appreciate the fact that you use curse words sometimes. It makes me feel comfortable, at your level, and that you are trying to be available and approachable. You are obviously a very intelligent and capable person based on your other writing, not just some punk teenager drawing comics and cursing on facebook. So, it is nice to hear your brains as well as your easy-going humanness. Thank you for being a great guy! And thanks for not trying to charge us for all the info… SOOOO much appreciation! Miela, this is one of the kindest comments I’ve ever gotten. Thank you so much. You’re right, it is a ton of work to put these together and it’s comments like yours that really make it worth all the effort. I’m glad you’re enjoying the posts. Like you, I scoured the internet when I first started out, looking for someone, anyone, to actually show me what I needed to do. There just isn’t anything out there! So I swore I would share what I learned to help other artists have the success they deserve. We worked really hard to give you guys everything you needed to get started without charging for it 🙂 Now don’t get me wrong lol we WILL be releasing a paid version of this information with one on one guidance from me later this year for the people who want the extra help but I wanted all the self starters like you to be able to do it yourselves! Thank you again, sincerely. Your comment made my day. Thank you Unky! I spent some time on your Instagram and web site today 🙂 you do amazing work! We need to get your IG optimized, grow your followers fast, and drive all that new traffic to your site. Not sure how much revenue you are currently generating but with the volume and quality of work that you do you should be killing it! One thing I do know for sure is that you should have WAY more followers on IG. Have you read the 50 million dollar star wars post yet? I just saw on pinterest that you can sell on Pinterest with Shopify. Looks pretty neat. That’s super cool, man. Thanks for sharing! I just saw an ad to try Shopify + Quickbooks free for 60 days. It was just the push I needed to get off my keyster and get this thing going. Now I have a Shopify account, and I signed up for Printful. One step at a time, I’ll be up and running soon! Thanks for all the great information, Christopher!! Hey, I’m a little late to the conversation as it’s November now, but thanks for posting this! I’m a fashion illustrator and want my sketches to be seen by potential high-profile clients, but I also want to sell products…the thing is, I don’t want my site to look like a store, primarily. I want it to be a professional-looking portfolio, where I also happen to sell stuff. Shopify looks so much like a store to me, at first glance…is there a way to hide the shopping cart and search function at the top? Or should I even be worried about that? Thanks for your time! In addition to my comment, I want to show you an example of what I mean…an artist who is very successful doing work for clients like Vogue, Cartier, etc. but also sells products directly from her site. The link obviously has shopify in it, but her web site looks very polished and professional and she doesn’t have the shopping cart at the top. Thanks again! Hi Deb, what an awesome question, thank you. There may be several ways to solve the problem you’ve described. Shopify has a ton of different themes, both free and paid, and many of these themes look and function like a standard website. Some even have parallax scrolling, so chances are you may be able to find a theme that fits your particular needs without it looking too much like a “store”. This appears to be what the artist you’ve linked me to has done. She’s clearly using a Shopify store, she’s just chosen a theme and made the necessary alterations to give it the look and feel that it has. Thank you for the reply, Christopher! You’re very helpful. I’m enjoying reading this series. Hi Christopher, I’m not done with the series yet, but right now I’m taking a look at shopify. I currently have a godaddy site for my whipmaking business, but I want to be able to sell promotional stuff for it and I also have a godaddy art sire under construction. I will most likely cancel that and switch to a platform where I can link to a good POD. Thank you so much for this entire series! Hi Tyler, what a super kind comment. Thank you very much. I’m very happy we could be of service, and will continue to be as helpful as possible with any questions you might have moving forward in pursuing making a living with your art. Oh, and hell yeah, I’d love to see some of your whips! Thanks for the post. How big do you think Shopify’s integration with Facebook is in choosing a Ecommerce platform. Do you have any comments on WordPress’s woo commerce? Just wondering. Fascinating posts. Thanks for all your hard work on this! My partner does art and I do photography, but we’re both disabled and on disability, so we are looking for something simple that doesn’t require a lot of energy or cost to set up and maintain. Our income will also be low, and that’s OK. Maybe WordPress and Woocommerce might work for us? It really helped me diced on what platform to use. I will start with Shopify. Hi Chris, I echo Miela’s comment, I like your down to earth real writing, inc. appropriate use of colourfull language! You’re the best, most informative blogger about art marketing, cutting the crap and getting to the juicy stuff. I have ME – no job and 0 income so I’ll have to start with Big Cartel. I was looking at a WordPress site with Woocommerce for cheapest startup so your advice is invaluable for me. I’m loving every post you’ve done and sooooo appreciate that it’s all free. You’re a star! Hi Kat, and welcome 🙂 Thank you for the very kind comment! Super happy you are finding these useful. I’d love to hear more about your progress and your results when you’re ready! I am not sure when this post series was written but I am so grateful I discovered it today. I’ve been on a journey this year of starting new things, and starting a creative business has been in my heart for some time now. I just didn’t know how. Or what, exactly. As a graphic designer, I am piqued at being able to create and sell my creations on many items. Thanks so much for breaking it down in these posts! 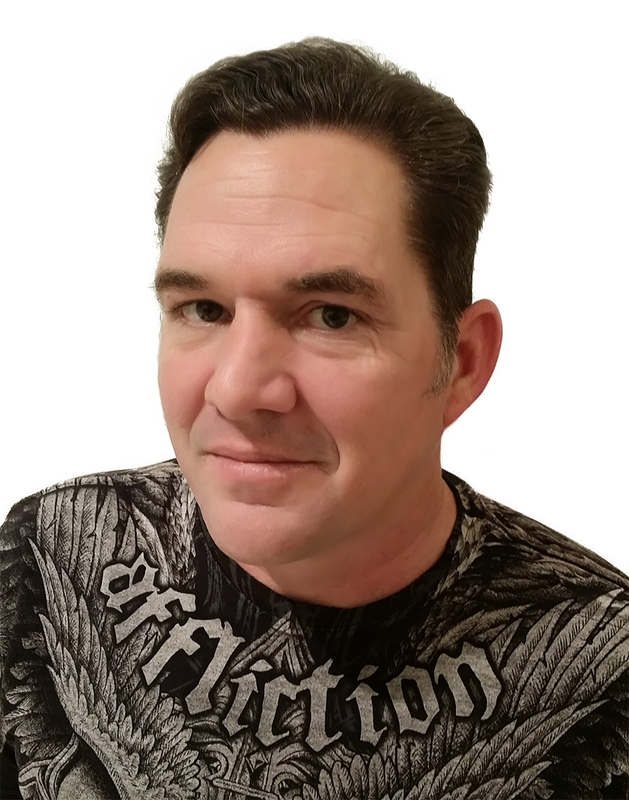 They have helped me see it IS possible and have given me greater clarity on how to start an online business. Thank you for these posts, very helpful and to the point unlike many others. What’s your opinion on Squarespace? I use Square as a payment processor, Big Commerce is free to use up to $10k/annum in sales, after which it becomes a paid service. Wow, I just came upon this site today for the first time. It’s really helping me to start asking myself more questions and figure out what I really need to research. I can’t say which of the three I’d start with yet. Looking forward to reading more posts! Thanks so much, Chris. Hey Buddy!, I found this information for you: "Big Cartel / Shopify / BigCommerce: Which is Best for Artists?". Here is the website link: https://copicmarkertutorials.com/big-cartel-shopify-bigcommerce-which-is-best-for-artists/. Thank you.